Manchester United striker Wayne Rooney has won the Barclays Player of the Month Award for December. The 20-year-old claimed the award after scoring five goals in seven league matches last month, doubing his haul in the Premiership to 10. His scoring streak included a double against Wigan, as well as goals against Portsmouth, Aston Villa and Birmingham. 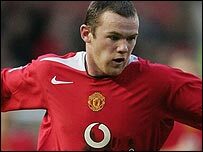 It is the second time Rooney has been honoured, having first received the accolade in February 2005. The England international's goals see him sitting joint fourth in the Barclays Race for the Golden Boot. His partnership with fellow striker Ruud van Nistelrooy is also the highest scoring pairing in the league with 25 goals.